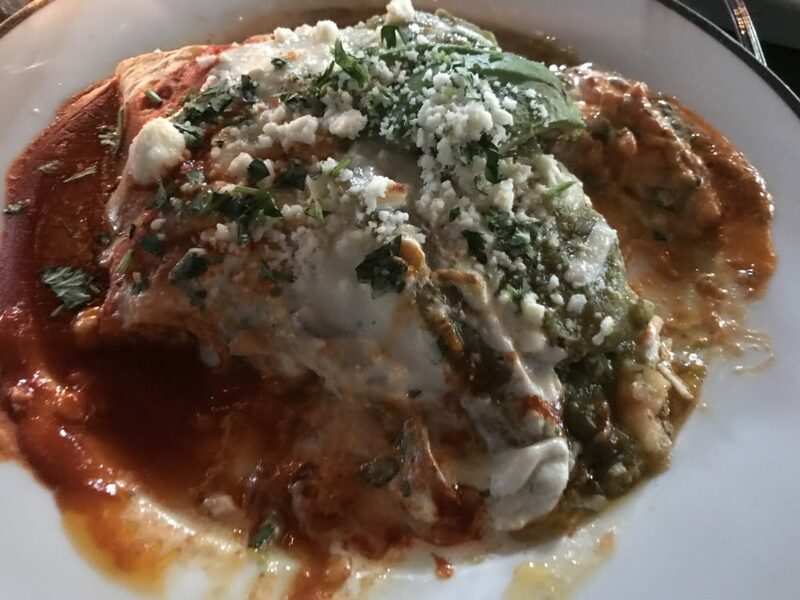 The newest addition from the famous Tucson El Charro family, now part of Flores Concepts, Charro del Rey has opened in downtown Tucson. In a 100-year-old building next door to Charro Steak, the interior exudes charm. Adding to the trendy restaurant scene downtown, Charro del Rey is destined to be a favorite. Four of us arrived during the 4-6 PM Happy Hour (or Horas Felices) and were excited to jump right in with half-price fresh oysters and wine and Margaritas. Lots of devine choices for this early menu, both drinks and small plates. We ordered 18 oysters and they were so good and fresh with wonderful piquant horseradish, we ordered 18 more! The restaurant was busy, but our waitress was attentive, filling our drink order immediately and giving us the scoop on the different oysters available. Several different people came by to make sure everything was good and we were happy! Choosing our dinner entrees was not an easy task…so many good options. We will surely be back to try what we missed on this first trip. The Enchiladas Banderas contained my favorite seafood. Meld Mexican and Seafood and you’ll have the best of both worlds. Does that look yummy or what? Delectable comfort food… Lobster, shrimp, and halibut rolled into fresh tortillas smothered in three salsas and topped with avocado and cheese. I couldn’t stop saying “ummmmm.” Large portions of rice and beans accompanied it. More than I could eat. Bub loves his prime rib! Even though fish was the focus here, he’d had a dozen oysters and wanted some meat. 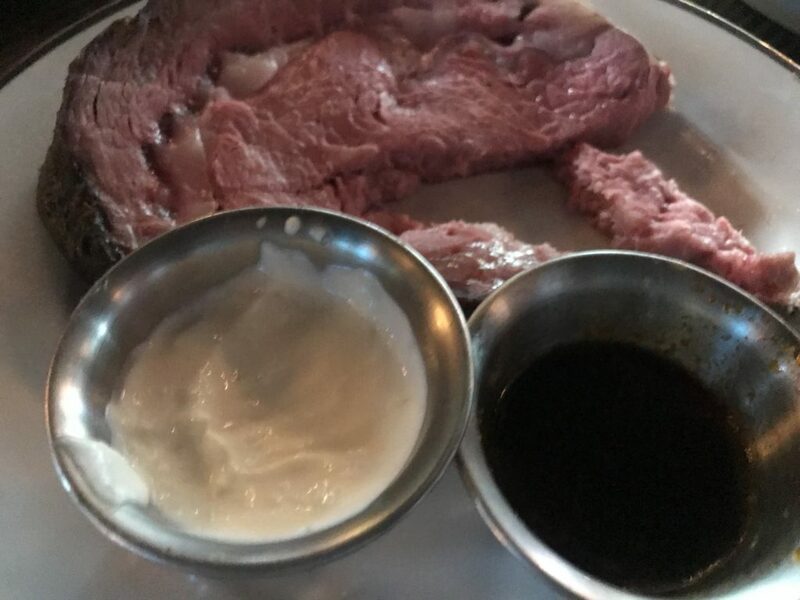 Aged 22 days, the grass-fed Prime Rib came with au jus and chile verde horseradish. On the side, he devoured his Mashed Potatoes also with chile verde. Our friends both choose Charvida Salmon. 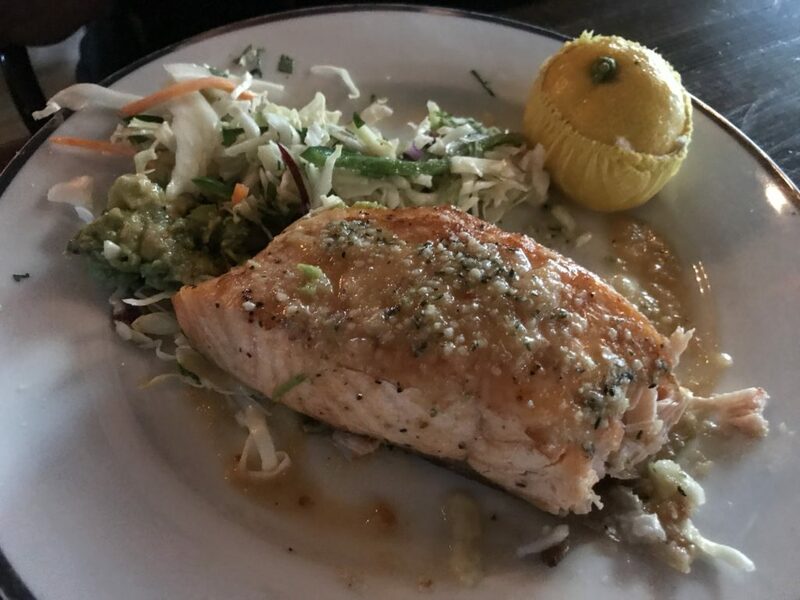 Citrus roasted, the Salmon was served on a bed of ginger jalapeño slaw and topped with a sauce with pepitas, avacado, and hemp seed. They both raved about the flavor and presentation. 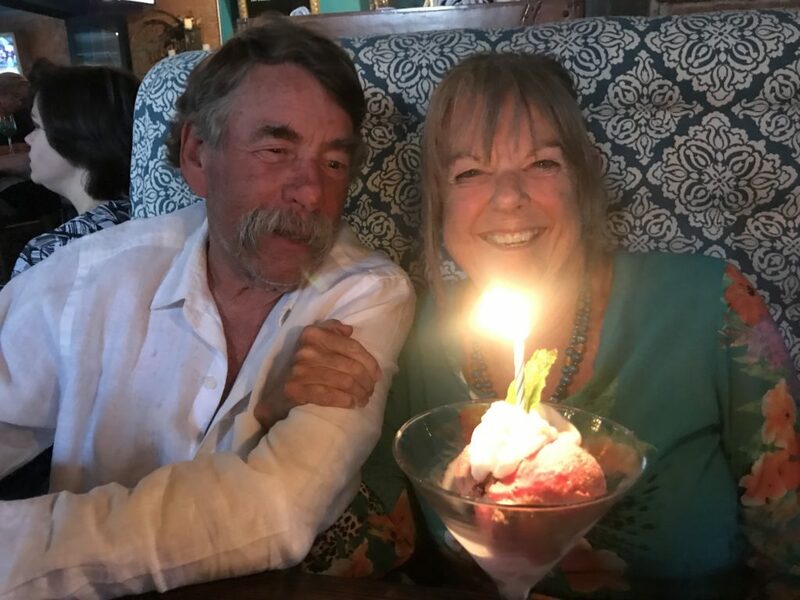 I got to blow out yet another candle for my birthday and enjoy a special dessert you won’t find anywhere else! Chocolate is always my favorite and the ice cream was smooth and satisfying. Pairing it with the tart raspberry sorbet whipped with Gran Marnier, was a match made in heaven! Other desserts, such as the Champagne Fried Strawberries will have to wait until next time. I know…Happy Hour goodies and drinks and then desserts next time. I think I could do that, but I’ll have to Uber it home, I think.